While most of us have closets that are full, crammed and cluttered and we can’t even choose which outfit to don for the day because there’s simply too many to choose from or it doesn’t suit our mood. There are actually people who have no choice but to wear the same clothes each and everyday because they simply don’t have any option. And then there are people who have lost their homes, their source of livelihood, their personal belongings, and their loved ones. This is indeed such a minor and simple step but it can somehow start anew with a daily change in clothing, especially for those who have lost almost everything. This can be something to look forward to and bring in hope for a better tomorrow. And it can even help them regain their self-confidence and self-esteem. Donating is not just about giving money but it’s beyond that. There can be too many ways to extend a helping hand to the less fortunate. How about de-cluttering your closet by simply giving away or donating a shirt or a pair of trousers for each new item you buy. Your disregarded garment can actually be a treasure to someone else. How it would be to live in a society, street and neighbourhood where there are poor people who are not privileged enough to wear new colors? It can’t be a beautiful view where there are some who have lost everything they had in natural calamity. Come and join our movements at Guitarmonk Social and let’s hold hand and be proactive in making this world a caring, better and more beautiful place for each other. 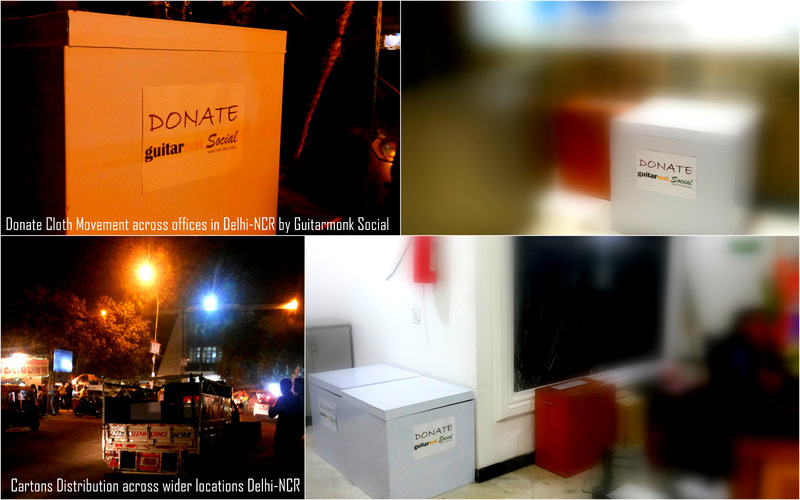 Cloth Donation is a regular activity of Guitarmonk Social, takes place at diversified locations of Noida, Gurgaon, Ghaziabad and all zones of Delhi and NCR. It is a part of ‘Share to Care’ movement by Guitarmonk Social.